Houghton Mifflin Harcourt, 9780547386089, 208pp. Since the publication of the best-selling Merle’s Door, Ted Kerasote has received thousands of e-mails asking two questions: “Have you gotten another dog?” and “Are you writing a new book?” Pukka: The Pup After Merle answers both, in the most heartwarming way. 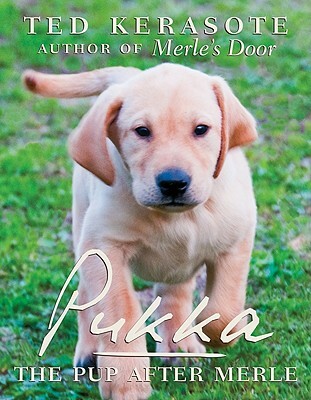 Told in Pukka’s charming voice and accompanied by more than 200 photos, Pukka: The Pup After Merle tells the story of how Ted found Pukka, recounting the early days of their bonding as they explore Kelly and the wider world. Walks become hikes and hikes become climbs, their adventures culminating in a rugged wilderness journey that teaches both Pukka and Ted something new about the dog-human partnership. Filled with stunning images of the West, Pukka is a love story as well as Ted’s take on raising a puppy. It will do pictorially what Merle did with words—show how dogs thrive when treated as peers while illustrating the many ways that any dog opens the door to our hearts.